Plastic playgrounds are made of recycled plastic lumber. They are long-lasting, safe, creative, and sustainable. But what are they, exactly? Let’s have a look. We use a lot of plastic. In fact, the global manufacture of plastics rose from 225 million tons to 311 million tons over the course of a single decade. When we recycle that plastic, it goes towards myriad uses.Recycled plastic building materials, such as plastic lumber, are made of a wood-like plastic form of lumber comprised of recycled plastic. Why should I build a plastic playground? Structural recycled plastic lumber makes for a safe playground solution. It doesn’t rot, mold or splinter, as happens with wood, so you need not worry about painful accidents arising from falling through rotted equipment or having to get out the tweezers to remove a splinter. It also resists insects and saves you from having to deal with the spread of mold originating from your playground. LEED stands for Leadership in Energy and Environmental Design. It is a green building signifier awarded to projects that earn enough points across several environmental factors, including energy use and air quality, to gain LEED certification.Owing to its durability and sustainability, adding a recycled plastic playground system to your building project can earn you points towards achieving LEED certification. With a LEED certification plaque on your site, visitors know that you put in some extra effort to construct a healthier space that is more productive and results in lower environmental impact through resource efficiency. 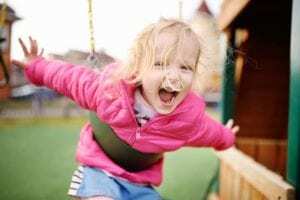 What maintenance does a plastic playground require? Recycled lumber plastic playground equipment makes for a highly durable playground. The material is manufactured so that its color exists throughout, rather than just on the surface. As a result, there is no need for painting or staining. Say goodbye to annual re-painting and re-staining weather-beaten wood. May I bring my pet to a plastic playground? Yes, and your pet will thank you. As recycled plastic lumber does not splinter, there is no need to worry about little paws or noses getting hurt. Bedford Technology offers smarter playground equipment with a 50-year warranty and has significant experience designing and constructing plastic playgrounds. Contact their professionals to get your project started!